Jen rocked it everyday!! She was definitely worth the eight hour drive and I can’t wait to study with her again. Jen gave me more confidence in staying true and and she truly represents the direction that I want to go in my own Pilate’s career. Jennifer Gianni presented the course with a profound understanding of her students’ needs and of the historical connections/evolution in Pilates. As a teacher who has been certified by other organizations, I can whole-heartedly recommend this course to both new and experienced teachers. Jennifer was several notches above any type of Pilates training I have had prior. I am 5 hours away, and am glad to know that excellent training/studios are this close by. (As opposed to New York and LA.) Her scope was specific to our needs, her presentation provided different methods of learning and was clear, unrushed, and open to discussion. Thank you. Casey was an exceptional and thorough presenter/educator. Her knowledge is extensive and her love of conveying it shows. I appreciate her gentle ways of encouragement. Jennifer, you are a great teacher and you inspire me to learn all there is to learn with Pilates. Thank you so much for adding to my knowledge as a trainer and my life! Casey is a wonderful instructor; I cannot speak highly enough of her knowledge and presentation. Her insights, feedback, and encouragement were very helpful in my course to become a Pilates instructor. I am greatly looking forward to more certifications with her as the lead. Casey Marie-Herdt’s knowledge of the material combined with her passion for movement and Pilates spurred my excitement and passion even further. I am feeling confident about working with my own clients, and I look forward to continuing my education with BBU. Would you like to host a Balanced Body Course at your studio? Find Out How. 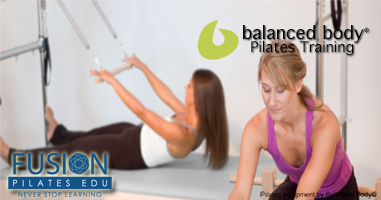 Balanced Body provides Pilates education for every stage of your career. We are committed to supporting your personal and professional growth. Whether you want to become a gifted Mat instructor, an inspiring Reformer teacher or a comprehensively trained Pilates professional, Balanced Body connects you to the widest array of educational offerings in the world. You will be trained by Fusion’s Master trainers with 20+ years of experience, thousands of hours of teaching and rehabilitation experience and who have trained and apprenticed with first, second and third generation teachers. Our program offers three levels of Pilates Instructor Education: Mat, Reformer and Comprehensive. Each level is offered in affordable modules so you can take your first course now and continue your training next week, next month or next year, whichever works best for you. Each module is designed to allow you to start teaching quickly and to continue learning as you progress. Upon completion of all of the requirements, a certificate of completion as a Balanced Body Pilates Instructor will be issued. Students who have completed their Mat or Reformer certification through other organizations can take the Balanced Body curriculum and receive a certificate of completion from Balanced Body. Students will need to provide proof of completion of a comparable Mat or Reformer program before being accepted into Balanced Body University. Please contact the office for details and a list of approved organizations. Observation hours include watching experienced instructors teach group classes of private sessions. Observation is a great way to understand verbal and manual cueing, program sequencing and to hone your teaching skills. Teaching hours include any Pilates teaching either as an employee at a fitness center or Pilates Studio or for family and friends.